I began guiding with CRE back in “the old days”, and I have guided most of the big rivers in the west and across the North. Whether it is raft or canoe, just put me on a river. Carpentry and skiing keeps me busy in the winter. The wildlife and hiking of the high arctic rivers are some of my favourite highlights. Put me in a raft, canoe or kayak anytime! I love being in the moment in the wilderness, waking up every day with happy people in an environment where, if I don’t have it, I don’t need it. 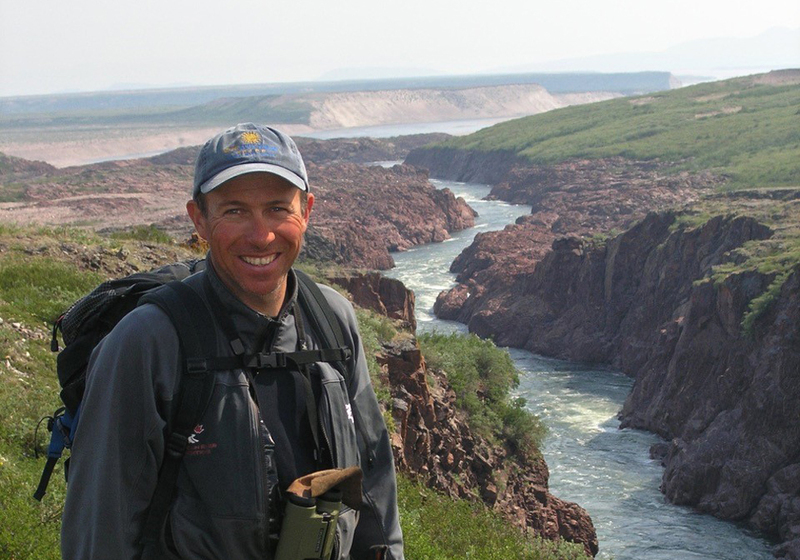 Rivers have been really significant in my life — I have made most of my closest friends and met wonderful and interesting guests on rivers, and I met the love of my life, Trish, on the Tatshenshini River, 15 years ago. This summer, 2017, is particularly special for me as I will be celebrating a few milestones with some great friends. It is my 40th year guiding river trips and my 30th anniversary with Canadian/Nahanni River Expeditions — I guess my gold paddle is in the mail, Neil? Also, this June-July will be my 40th trip on the Firth River, what a way to celebrate Canada’s 150th birthday!! The Firth was my first wilderness trip as a guide back in 1984 and is very special to me. Now, you are probably thinking this guy is racing his best before date down the river. But, while it’s true guide years are almost as bad as dog years ( you multiply them by seven), wilderness and river travel definitely have a rejuvenating effect on one’s soul and we see this daily in the faces of our guests. Through my many river miles, I have flipped thousands of pancakes, but for each one I have an incredible wildlife viewing experience or special memory shared with friends and guests. When not on the water, I work as a woodworker and carpenter in the Vancouver where I live with my with Trish.